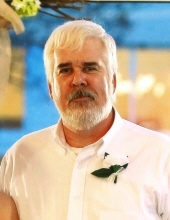 John Albert Green, 59, husband of Rosie Jane (Reynolds) Green of 5079 Morris Mill Road, passed away Thursday, March 28, 2019 in the University of Virginia Medical Center in Charlottesville. Mr. Green was born on February 21, 1960 in Warren, Pennsylvania, a son of the late Raymond Louie and Ethel Jane (Roberts) Green. John was employed as a mechanic with Verona Car Care, and retired in 2006 from American Safety Razor with twenty-eight years of service. He enjoyed working on cars, watching baseball and playing with his dogs. John was a devoted grandfather and loved spending time with his grandchildren. In addition to his parents, Mr. Green was preceded in death by a sister, Bonnie (Traylor) Bender. Surviving in addition to his wife of thirty–eight years, is a son, Andrew Green and his wife Carmen of Swoope; a daughter, Jessica L. Botkin and her husband Chris of Staunton; four grandchildren, Jon David Lyle, Brailyn Green, Brody Green, and Harper Botkin; four brothers, Vernon Green of Grottoes, Richard Green and his wife Julie of Verona, Dennis Green and his wife Bonnie of Chicago, Illinois, and Bart Green of Youngsville, Pennsylvania; a sister, Paula Morris and her husband Ricky of Churchville; and a number of nieces and nephews. The family will receive friends from 6:00 p.m. to 8:00 p.m. Monday, April 1, 2019 in the Coffman Funeral Home and Crematory and other times at the residence. A Celebration of life will be conducted 11:00 a.m. Tuesday, April 2, 2019 in the Coffman Funeral Home Chapel by Pastor Lynwood Wilkes. Burial will follow in Green Hill Cemetery in Churchville. Active pallbearers will be Kent Watts, Billy Koiner, Terry Johns, Mike Ledbetter, Kevin Reynolds, Bobby Reynolds, Merv Benson, and Kevin Traylor. Coffman Funeral Home and Crematory, 230 Frontier Drive, Staunton, is in charge of his arrangements. To send flowers or a remembrance gift to the family of John Albert Green, please visit our Tribute Store. "Email Address" would like to share the life celebration of John Albert Green. Click on the "link" to go to share a favorite memory or leave a condolence message for the family.